Spiced bangers served on sweet potato mash & cumin spiced onions with a cucumber salad. Cucumber ribbons: Use a potato peeler to carefully slice the cucumber lengthways into long, thin ribbons. When you reach the seeds, turn the cucumber and repeat on all the other sides. Discard the core containing the seeds. Lemon: Using the fine side of a box grater, grate the peel of the lemon to create zest, then cut in half and juice. Sweet potato mash: Place a pot on high heat and add boiling water with a pinch of salt. Add the sweet potato cubes and boil for 15 minutes until soft. Drain, add a knob of butter and salt and pepper to taste and mash with a potato masher. Pork bangers: Place a pan on medium-high heat with a drizzle of olive oil. When hot, add the bangers and brown for 3 minutes, shaking the pan to ensure they’re browned evenly (they don’t need to be cooked through at this point). Remove and set aside. Cumin coriander onions: Using the same pan on medium-high heat with a drizzle of olive oil, add the onions with the ground coriander and cumin seeds and cook for 3 minutes. Add the bangers back into the pan with the atchar masala and cook for 8-10 minutes until the bangers are cooked through and the onions are soft. Move everything around in the pan so the onions don’t burn. Cucumber ribbon salad: Mix the lemon juice, coriander (reserve a little for garnishing) and HALF the lemon zest (add more to taste) through the cucumber ribbons and season with salt and pepper. Serve the sweet potato mash topped with the onions and pork bangers, with the cucumber ribbon salad on the side. Sprinkle with the rest of the fresh coriander. 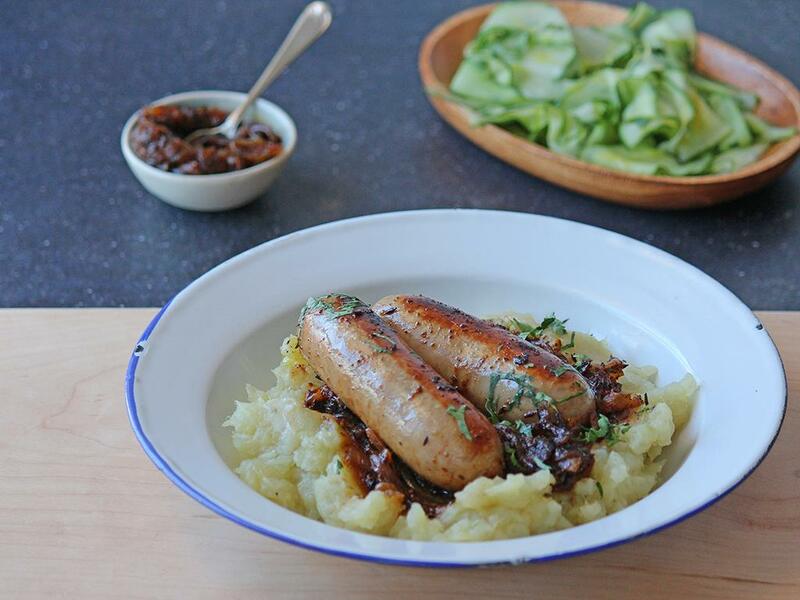 "Easy to prepare, and the sausages are outstanding. "